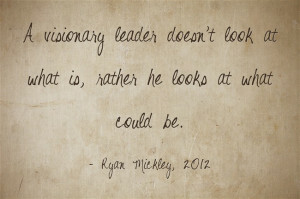 The great news is that visionary leadership is a skill and YOU can build your own visionary capacity. In the book, Anticipate: The Art of Leading by Looking Ahead, Rob-Jan De Jong explains how anyone can develop their visionary capacity and become a more visionary leader. During this time, a future visionary learns to submit to godly authority. In this stage the future visionary�s style is shaped by the strengths and limitation of the lead visionary.